HOVER MOTOR COMPANY: Welcome to Hover Motor Company. Let's sit down, light a cigar, and talk some cars. Welcome to Hover Motor Company. Let's sit down, light a cigar, and talk some cars. Hover Motor Company. What is that anyway? 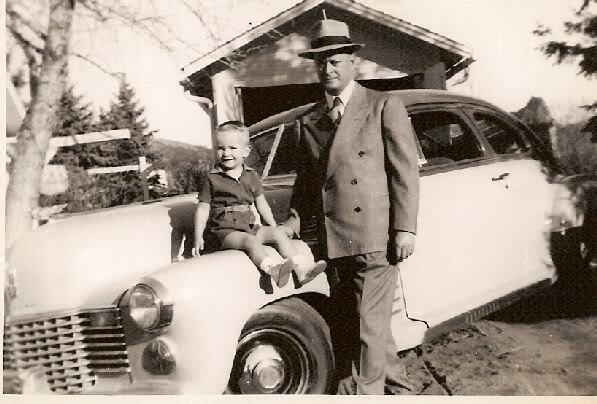 Back in the 1930s, my granddad, Robert Hover, opened his first Hover Motor Company used car lot in Colorado Springs. He was in business through the 1970s, until he finally gave up to enjoy the sedentary life. And that's where I came in. 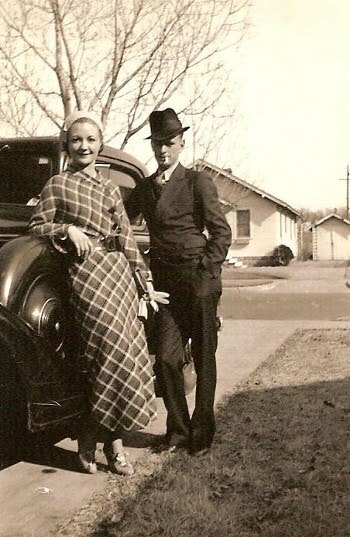 Our family used to visit my grandparents in Colorado pretty often when I was a kid, and the dominant conversation was stories my dad and granddad would tell about things that happened involving the car lots. I vividly remember one story in particular about what kind of damage certain animals will do to a car when you hit them. You see, the car lot was mostly run granddad, dad, maybe some of dad's friends, or a small cast of characters that worked for peanuts. They would go all over the middle of the country and buy cars they thought they could make a little money on. So they'd ride the bus, take the train, or drive out and find something, and either drive it back home or flat-tow it. They did this quite a bit, and spent a lot of time driving at night. So they had the opportunity to clobber their fair share of creatures. Evidently, a pig will really tear up the front of a car because you drive up on it. You'll bust the legs off a horse, and it'll come through your windshield. I could go on, but you get the idea. And these stories were told with a heavy dose of swearing and smoking. It sounds pretty awful for an asthmatic little kid to sit around and hear some of this uncensored stuff while choking on cigar smoke. But you know, it wasn't. I enjoyed it. I miss it. My granddad died more than 30-years ago, and I still think about those times with fondness. And that's kind of what I'm planning to do here. I don't plan to get too gruesome, and I'll keep it family friendly, but I want to have that enjoyable chit-chat atmosphere on a subject that I know and love. We'll talk about cars, car places, car models, and collectables. But we'll keep it pretty casual, and hopefully have some fun. And in the meantime, I've made some pretty great memories with my dad over the years. I don't know if my son is as excited about some of our "old" stories, but he does have a keen interest in cars, so at least I'm doing something right. I wish I had a place like this where I could go back and relive some of those memories from the past. Maybe this will be a place where he can come and appreciate some of his car heritage. Hover Motor Company used car lots have been closed and forgotten for many years. But with any luck, the legacy will live on with a little history, a few good stories, and some good old car fun. I hope you stay tuned to this page to take that journey with me. I remember these stories as well; not first-hand, but during several trips to Lakeside Speedway or I-70, or on a good weekend, both. Here is one to add....I remember going 123MPH in a new Impala SS in the early '90s. This extreme speed was necessary to get around a person who probably should not have been driving. Anyway, as a close friend, I can attest to the stories and more importantly to the love of cars that seems to be heredity in this family. Well, hello, Steve! We had some good times back then. Don't drive 123. That's dangerous, and nothing like that ever happened! I still have that Impala in my garage, by the way. So what about that old green chevy pickup with like a half-a-million miles (literally). Is that old quarter-ton still street legal? Haha--well, John finally sold that, and bought a Chevy cargo van that already has nearly as many miles on it today! Hover is a good name, you or your son may continue the dream in automobile and may be one day I could see a car brand with the name "Hover" on it. I just Googled your company name, because it was screwed to the back of a '63 Ford Fairlane 500 in a shop in Grand Prairie, Texas. It is getting loved on, getting a new interior at Cash Auto Repair (972)264-6060. I remember hover motors on speer blvd and federal in Denver,Colorado back in the early 1970s. my folks use to always get these pencils that said sharpest pencil in town.. Nice car lot back then. Never been to Colorado or Hover Motors, but I know those characters that hung around there. I grew up in a small town(pop.225) in southern Missouri, and those same denizens hung out at the Mobil Gas station there. I remember the White Owl Cigar smoke , and some of the stories were the same blue color. Probably some things a 10 year old shouldn't hear, but we learned a lot about life that way..
My dad bought a brand new 1963 1/2 Falcon Sprint from Hover Ford what a great car as a kid I remember it had a body style that was tough to beat so after all these years I bought it from my mom after my dad passed and now I plan on keeping it in the family for the next 50s years. I wonder whatever happened to Hover Ford, if they were bought out by O'Meara or Rosen-Novak or whatever. My '76 Ford F100 still runs & drives great & still has the Hover Ford badge on the tailgate which includes the image of an UNSHARPENED pencil!